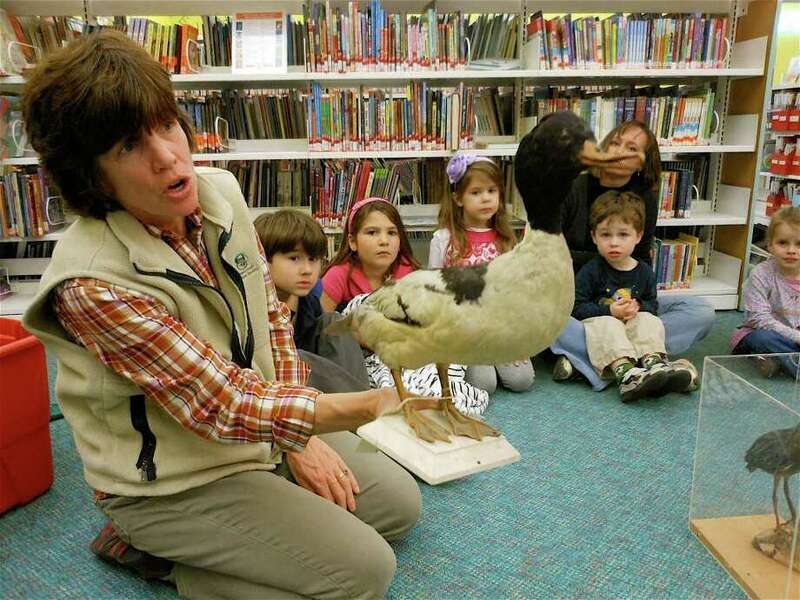 Connecticut Audubon naturalist Colleen Noyes discusses some of the features of the Merganser duck during a Creature Feature program Tuesday at the Fairfield Woods Branch Library. Instead of the usually hushed environs of the Fairfield Woods Branch Library, there was a lot of wiggling around, fidgeting and chatter, as well as chirping and croaking, going on Tuesday. The noise was emanating from a menagerie of youngsters attending a program led by Colleen Noyes, a teacher/naturalist at the Connecticut Audubon Society in Fairfield. The monthly Creature Feature, which focuses on a different animal, on Tuesday was all about waterfowl. Star attractions were life-sized models of a Green Heron and a Merganser duck, along with the appropriate sounds generated by an electronic device. More than a dozen children, mostly 3 to 8 years old, were in attendance, accompanied by their parents or caregivers. "We get kids familiar with various regional birds, as well as other animals that are mostly native to the region," said Noyes. "Kids are fun to work with ... unpredictable, especially after school. I always get surprise questions. They're funny, and often very smart. A lot of times the kids know more than I do. You just go with it and let them come up and help." Among those at the program were Ali and J.T. Tamayo, with their nanny Sherene Barnett. The children looked on attentively as Noyes pressed different buttons on an audio device to play animal noises and asked the group to guess which creature makes it. Patty Baron, with her children Sean, 5, and Megan, 8, of Fairfield, said she was a veteran of the programs. "We like to come to see the live animals -- like snakes and reptiles," she said. "We always learn something new." No one learned more than 7-year-old Zachary Grignana, however, who was decked out by Noyes in accessories that simulate a duck's features: scuba flippers for webbed feet, a vest for the bird's down layer, goggles to represent a protective eye coating. Zachary's get-up provoked more than a few "squawks" from fellow kids.